The Swing Band are an established swing band for hire, perfect for functions, weddings, corporate events and parties across the UK. The band perform a selection of the most well known songs from the 40s and 50s covering the likes of Frank Sinatra, Dean Martin, Sammie Davis Junior and Tony Bennett. With years of experience behind them, the band are certain to have your guests swinging like the 40s with their irresistible charm and charisma on stage and off. 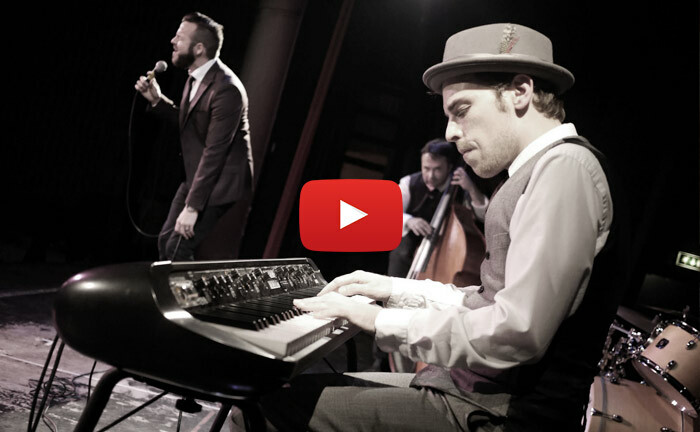 If you're looking to hire a swing band, The Swing Band could be right up your street! 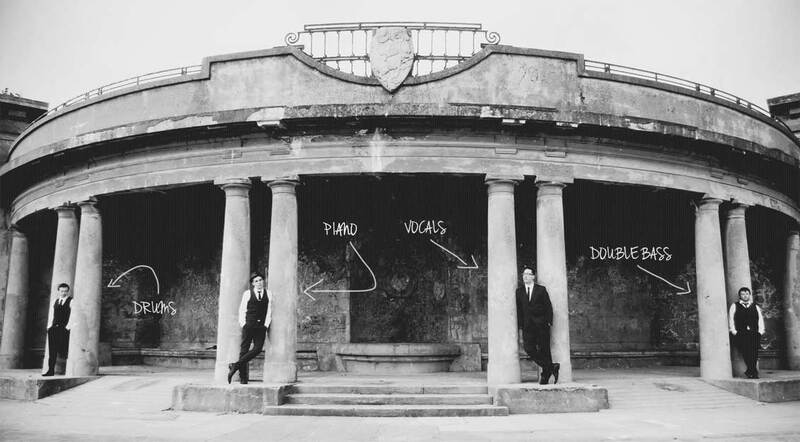 The band's line-up consists of four talented musicians to include lead vocals, piano, double bass and drums; the perfect combination for evening wedding receptions, daytime drinks, corporate champagne receptions and more. If you're looking to go the extra mile there's also the option to add on sax and guitar for a 5-piece or 6-piece band. The Swing Band come completely self-contained with their own PA system so you don't need to worry about a thing, if you're not looking to book a DJ afterwards the band also offer the option to add iPod music after their set has finished. The Swing band have played hundreds of events over the years so you can be assured of a highly polished and professional service from start to finish, their back catalogue of events includes weddings, birthday parties, themed events, Great Gatsby style parties, corporate events and more. We have a fixed pricing structure based on travelling distance and performance times, if you're looking to hire a swing band and you'd like an exact quote, please get in touch using our contact form. I'm finally getting round to dropping you a line to say thank you for being part of an amazing evening and having you and your band there making it an event to remember. So many positive comments and feedback about the night and 'where did you get that band they were amazing'. All I can say is if we ever need a band again, or any of our friends are looking for one, we would have no hesitation to recommend you. Thank you for making our wedding reception what it was. Have a great day! We just wanted to say a huge thank you to you, the singer and the rest of the band for making our wedding so very special.. you guys are brilliant!!! I must admit we love swing music but we were a little nervous how a swing band was going to go down with all our guests. We were blown away with how much our guests thoroughly enjoyed the band and that's from the 8 year olds running around dancing to our grandpa who might I add is 101 - you made his year, he enjoyed every minute listening to you and refused to leave until you had finished and he even got up, for a brief minute, and even danced with me.. Thank you so very much. The singers voice was pure liquid gold. Claire and I wanted to say a massive thank you for kicking off the party at our wedding on Friday. It was an incredible evening and we're grateful for the part you guys played. Many thanks and best of luck with the rest of the season! All our guests were equally complimentary and we would like to say to the Band members how appreciative we are for their performance on the day. We were told that the saxophonist was a late replacement and if this was the case he did amazingly well but i guess that shows they all experienced musicians. The singer was great and the range of music was just what we had hoped it would be. All in all therefore we were very satisfied with the Band and thank you all again for your contribution. The Swing Band are so amazingly talented and full of energy. We had a full dance floor all night. I just need another excuse for a party to hire them again. So many people commented to us and also spoke to them directly to say how brilliant they were. I would highly recommend them. Just wanted to say thanks for an amazing performance on Friday, really really enjoyed it and got incredible feedback from everyone there! Please do thank the rest of the band and let me know if there’s anything I can for you. The band were just absolutely fantastic! So helpful before hand, so friendly on the night and the performance was brilliant. Everyone commented on how great they were and what an authentic and natural swing sound they had, not a touch of karaoke! I couldn't recommend them enough. On behalf of Matt and I we would just like to say thank you SO much. We danced the night away. Spent most of the reception on the dance floor. Every song was amazing you surpassed our expectations and everyone commented on how fab you were! Thank you thank you thank you!! Peter and I would like to thank you all for the fantastic set you played at our wedding. You really set the mood for our guests and we received only positive comments from everybody. It was an absolute pleasure to work with you. You have been so professional from start to finish and that reflected in your performance on the day. Both Peter and I agree that the choice of music and your image really complimented the venue and the ambiance. Please pass on our compliments to all the band members as you all deserve to know how fantastic you were. Thank you once again for being part of the most magical day of our lives. Positive, friendly and talented, exactly what we wanted! Thank you! We chose The Swing Band because we wanted music that was classy, fun and something everyone could dance to. They absolutely delivered. They started with a low key set before our first dance, a special version of The Beatle's I've Just Seen a Face. The band were tight and professional; you could tell they enjoyed playing. The singer brought humour and personality to the songs, sometimes improvising little skits or involving the crowd in choruses. All in all The Swing Band made a great difference to our wedding day. We would strongly recommend them to anyone looking for something timeless and fun to add a touch of swagger to your evening. Thanks again for your work on the day. You genuinely were a real treat. My husband Sam and I would like to thank you and The Swing Band for the fantastic music they performed on our Wedding Day. I have never seen so many guests dancing at a wedding before! We all really enjoyed the quality, professionalism, and groove of the entire band! It was a huge success! We wish you and The Swing Band lots and lots of success in the future and will make sure to highly recommend your services! I want to say thank you very much for organising the band at KIm & my wedding on saturday. They were brilliant, very professional at all times, looked the part and helped make our wedding the very special day it was. They are a great bunch of lads and wish them all the success in the future.